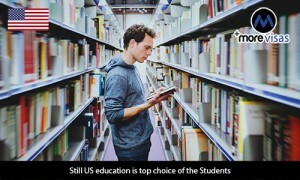 The United States education is considered as the costliest in the international educational circuit. Despite being costliest, the United States do not grant visas easily. There is a stringent procedure of an interview at Embassies of the United States. There were cases where even after getting the visas, the students were still deported. This explains the tough scrutinizing process of the US Immigration. The World Class research facilities in the Universities provide great exposure and the freedom to learn new things. The research and development initiatives of the Universities have produced numerous marketable products that drive growth and a comfortable lifestyle for the people. The major scope is of opportunities post completion of education. As you know, the Science, Technology, Engineering and Technology streams can apply for the H-1B programs and can gain further permits through Optional Practical Training (OPT) programs. Recently, the United States Citizenship and Immigration Services announced the extension of duration for OPT training to three years. Students can live in the United States for three years post completion of their education under OPT training. It clearly proves the fascination for US education and skilled visas. Despite the anti-immigrant rhetoric, the USIC has seen a significant increase in student visa applications and H-1B visas.